Aaand the secret is out. There have been three moments in the story where I feared it could be too easy to guess that Rogier was the Medlin’s son. I remember how scared I was when I posted each of those three pages, hehe. Well he definitely has her hair. He does look like Kveld! They’re both Galagardian 🙂 The page you linked was definitely the biggest hint, with Minna’s hair being so similar to Rogier’s. The other two were more subtle. The first page is 155. In the newspaper they found in the hemeroteque, the article mentioned the death of Minna, her partner and their child. The third page is 169. 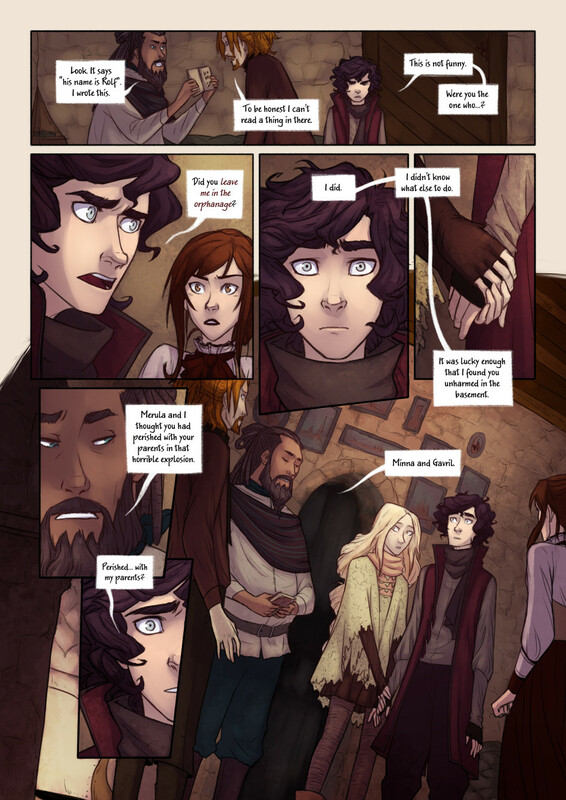 Right after finding the Bookwyrms picture, there’s a panel where we only see Rogier’s feet and a dragon toy on the floor. Noor, next time you leave a kid at an orphanage, please leave the note writing to somebody with better handwriting! Ahh, I didn’t see that coming! Mostly because I’d forgotten the names of the other original Bookwyrms. XD But it made me want to re-read the whole thing, and I swear this comic gets better every time I read it, I just pick up more and more small details! The hints were definitely there, just the focus on the Medlins and the trip to the house, especially the photo, he’s definitely got his mother’s hair!